Australia, 2017, 100 minutes, Colour. Directed by Marcus Cobbledick, Dan Jones. 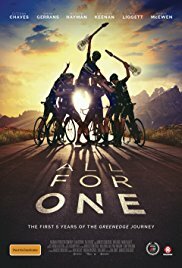 For cycling fans, this is a must-see documentary. For Australian cycling fans it is a must-must-see documentary. And, even for those who know practically nothing about cycling, there is an optimism and humanity underlying this story. The fans will know Australian involvement in the main cycling events throughout the world – and the limited presence prior to the first decade of the 21st-century. However, a number of entrepreneurs who loved cycling, took the initiative, found the finance, to set up an Australian team, Greenedge Orica. And this is the story. While the film has its quota of talking heads and commentary, there is a great deal of storytelling, enthusiastic promotion, and a focus on individual characters and their achievements. The early part of the film shows the initial scouting for talent, training regimes, camps away from home, the varieties of expertise both physical and psychological. There is also a general bonding amongst the members of the team, quite a large group from whom star riders will be selected, others will be support and backup. There is also mention of the main cycling events in Europe, starting with the Tour de France, the Spanish Tour, Italian rides focusing on Milan, and the Paris- Roubaix competition. There are many sequences throughout the film of all these events. There is the exhilaration of those in the lead. There is the crowding of riders at the start and their beginning to thin out. There is the endurance of the different terrains that have to be undergone. There are the technical difficulties. And, the film does not shy from the frightening crashes and the tumbling of so many riders onto the road. The film’s screenplay also uses the chronology, with dates on the screen, from 2012 onwards, indicating the developments, some of the successes, a number of the disappointments, the camaraderie amongst the team. Several individuals are singled out for consideration. The first is Simon Gerrans who had established himself as a rider and as a personality, especially with the Tour de France. He had great success, supported by wife and family. There is also the moving sequence where he could have continued wearing the leader’s colours but gave them to him his co-rider, Daryl Impey. There is a focus on the two individuals. There is Matthew Heymann, older, successful but not as he would wish. There are also his injuries. The latter part of the film, that shows his almost super-human effort to overcome injuries and to compete in the Paris- Roubaix. The film shows various cyclists and managers listening to the commentary ultimately surprised and overjoyed with Heymann’s final success. There is also the story of Esteban Chavez, a young cyclist from Colombia. He had suffered significant injuries which might have put him out of professional cycling for a long time, especially without the backup and finance of an organised team. There are several scenes of him at home and scenes of his parents, grateful to Orica for giving opportunities for their son. He is a lively character on screen, youthful, learning English (and Australian expletives), glad to be part of the unit, training, singled out by the coach (who is very direct, abrupt, taking no prisoners) and finally being encouraged to ride. The film shows his successful ride, especially an extraordinary uphill sector and his overcoming his previous difficulties and winning. Obviously, the story is still in progress – but the film offers an opportunity for a celebration of what could be achieved and what has been achieved.